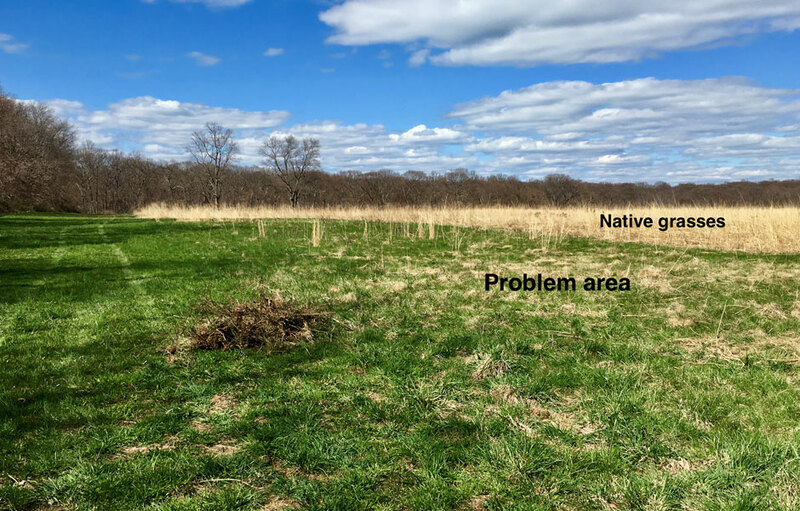 2018 marked the fourth growing season of the 30-acre grassland restoration project. 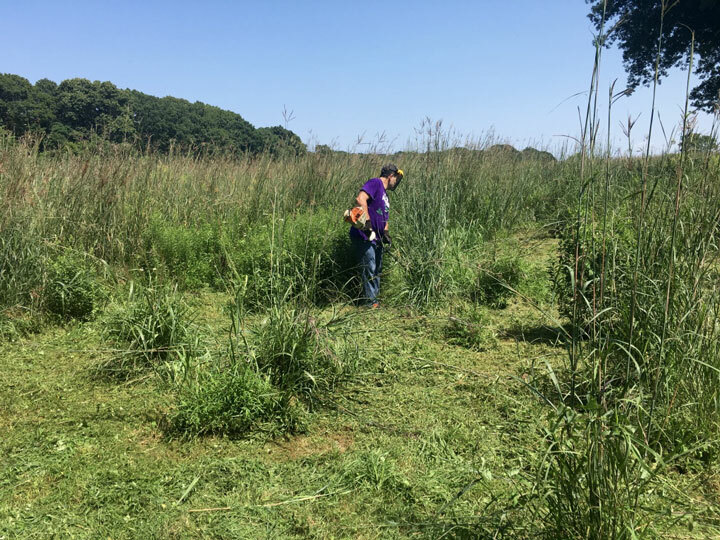 As planned the entire grassland was NOT mowed during this season and areas of invasives were managed by regular inspections through out the summer by two summer environmental interns. Only one narrow section of the field required a single tractor cut at the end of May due to the extensive presence of Mile-a-Minute (MAM). 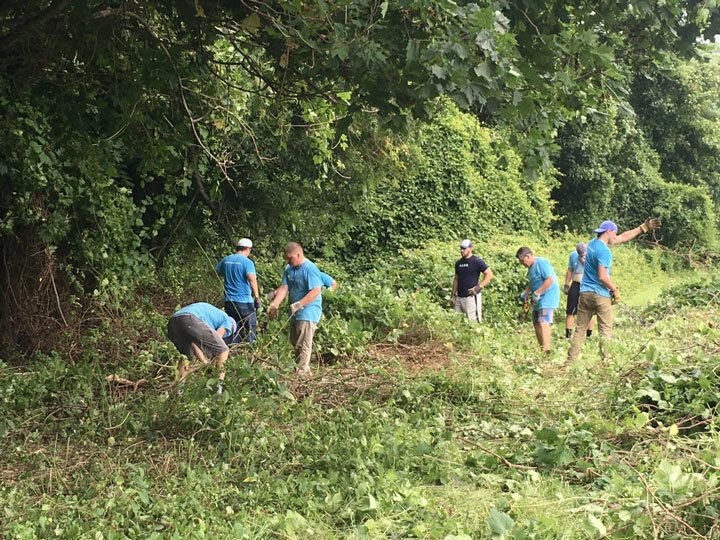 With the exception of this area removal of invasives was accomplished by weed whacking, hand pulling, seed clipping and use of a weed wrench. 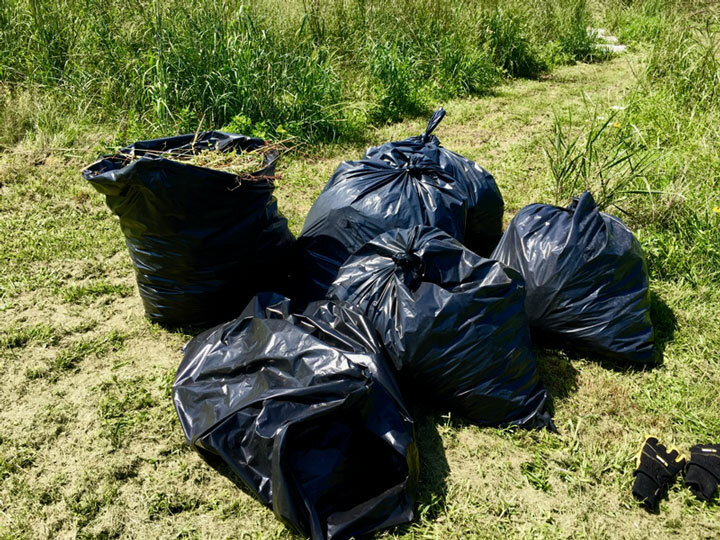 The major invasives during the 2018 season in order of highest man-hour removal effort were Canada thistle, Mugwort, Black locust saplings and Mile-a- Minute. The highest concentration of invasives occurred primarily in the center of the field with MAM being the most dominant. In contrast, Mugwort and Canada thistle occurred in small patches throughout field. For the first time the removal of Black locust saplings became a significant component of the management strategy. 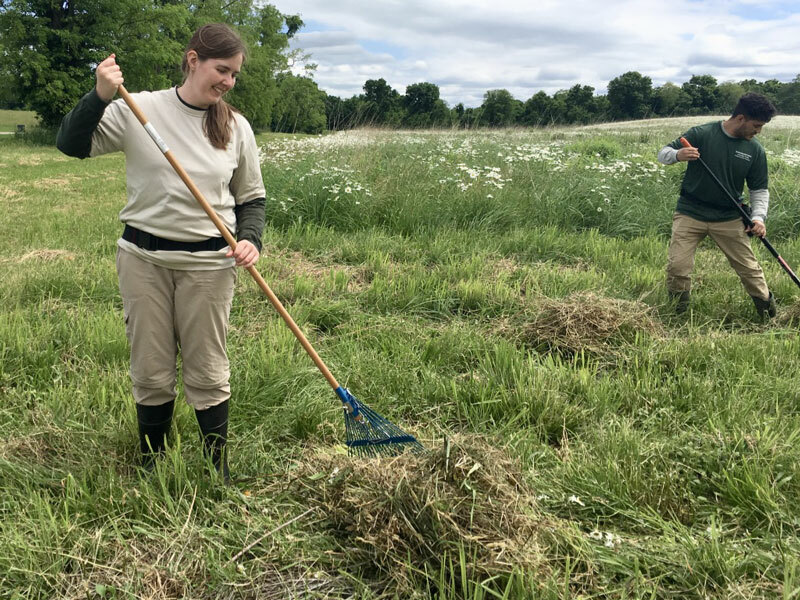 Because the field was not mowed locust sapling reached an average height of 4 feet by the end of May and a total of 259 saplings were removed. The warm season grasses continued to flourish and dominate the field. Similar to the 2017 season Big bluestem was most abundant however unlike 2017 Indiangrass appeared to be less abundant. In the northern section of the field that suffered significant erosion prior to the 2015 seeding Little bluestem grows in an open sandy and rocky substrate colonized by moss and lichens. These physical conditions have lead to a different habitat compared to the rest of the field, which may lead to an increase in the overall biodiversity. Although several species of goldenrod and other forbs continue to spread within the field the ratio of grasses to wildflowers remains high. 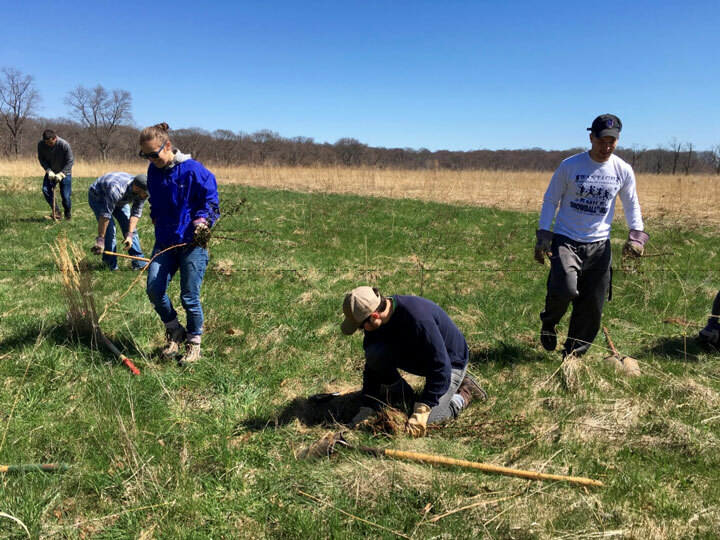 As a result, plans to increase native forbs will continue in 2019. A 0.1-mile walking path for patrons was cut through the northeast area of the field. Native wildflowers were planted along the edge of the path. 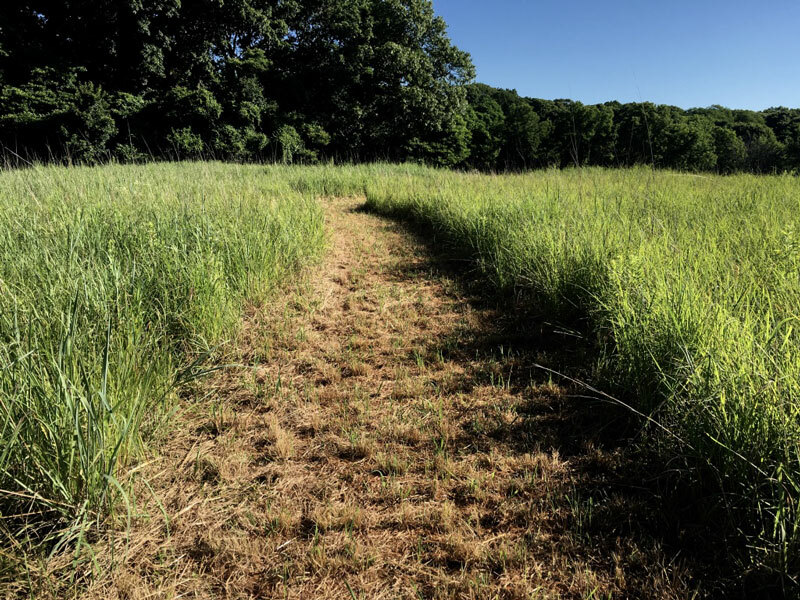 NYS Parks LI Regional Environmental Office has proposed plans for an educational grassland garden at the head of the trail. In mid-May an infestation of MAM was discovered in the northern section of the field beginning at the eastern edge and extending west in the direction of the two Hickory trees within the field. The MAM was likely caused by a past infestation from an invasive hedgerow, which had been removed as part of the restoration. The effort made to hand pull and rake the MAM off the field was inefficient. To rid the area of MAM a tractor with 15’ wide bat wings cut the vegetation to a height of 6 inches. The dimensions of the area were approximately 30’ by 600’. This strategy proved successful in reducing MAM to a manageable level for the remainder of the summer. Mowed invasive area on May 31st. Interns measuring the height of vegetation. 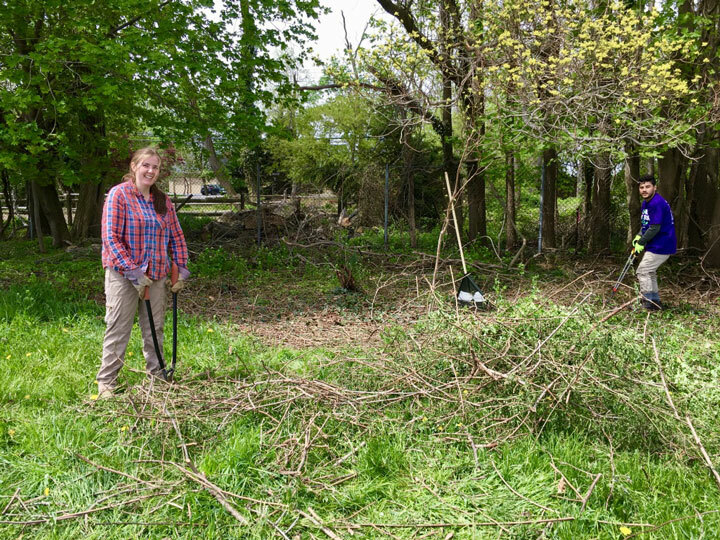 After the area was mowed interns rake and bagged cut vegetation from the area. 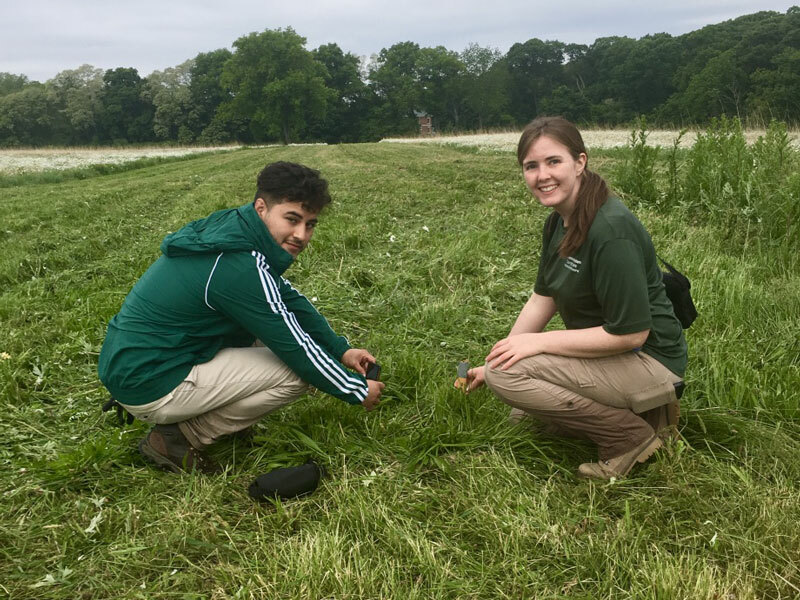 Mapping: An integral part of the 2018 internship was mapping the location and density of key invasive plants within the 30-acre grassland restoration field. The result of this effort produced a map with seven survey intervals showing the location of invasive patches within each interval. Systematic mapping of the field allowed for timely and efficient removal of problematic invasive areas. Density Distribution: Densities of key invasives were determined to be low, moderate or high. It should be noted that while density approximations were consistently applied they were not rigorously defined for future application. Total Man-Hours: The time spent removing each species of invasive plant was recorded over the course of the summer. Total man-hours of removal for key invasives in 2018 summer. 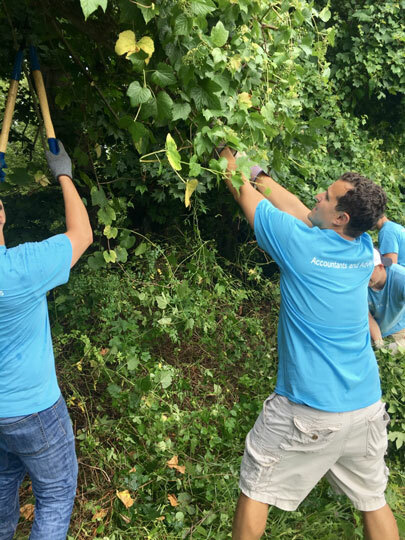 Interns and volunteers removed invasive infestations using several methods depending upon the species. The weed wrench was very effective in extracting Black Locust saplings quickly and without disturbing the surrounding soil. 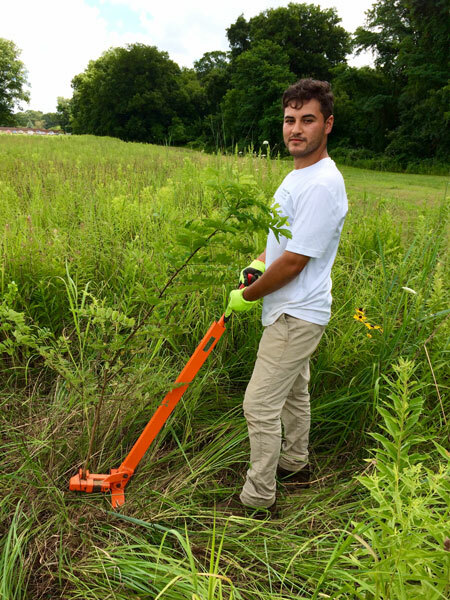 Environmental Intern using weed wrench to remove Black locust sapling. Three methods were used to remove this plant. Hand pulling and the weed wrench in areas where the soil allowed the roots to be easily pulled. Later in the season flower and seed heads were clipped and bagged. Canada thistle seed heads being cut and bagged. Removal of this species depended upon the density and extent of the infestation. 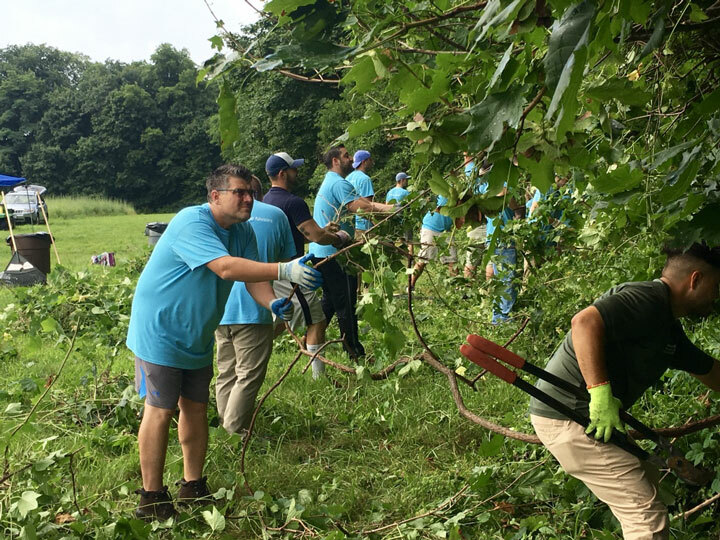 Hand pulling was useful in less dense sites while raking proved more efficient in dense stands before the surrounding vegetation grew too tall. Bags of MAM invasives getting prepared for solarization. Mugwort was cut low to the ground with a weed whacker several times. It was important not to allow this species to grow too high as the stems became hard and often resulted in breaking the string of the weed whacker. Volunteer weed whacking a dense stand of mugwort. 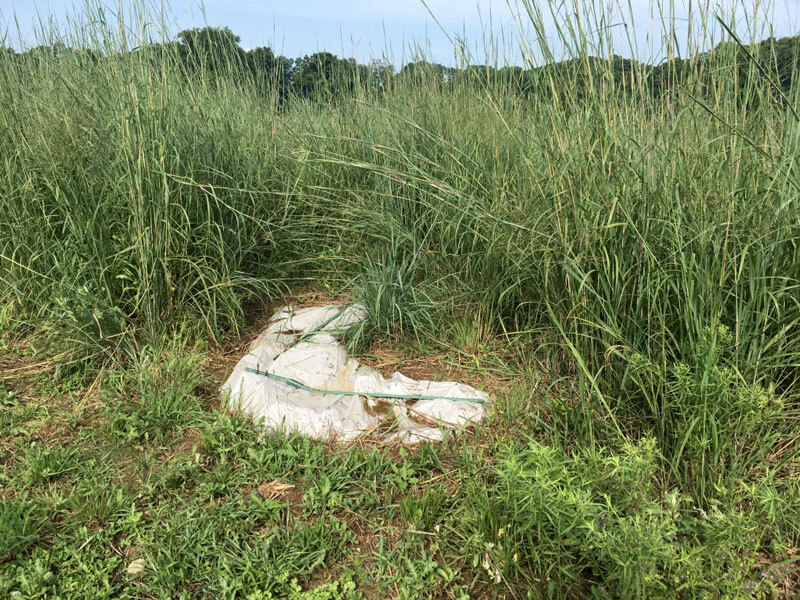 Along the southwestern perimeter of the field an area of approximately 140’ x 40’ was not treated in 2012 in order to protect Baltimore Checkerspot Butterfly larvae. Consequently this patch did not respond as well to the native seeding in 2015 and became dominated by pasture grasses and multiflora rose. 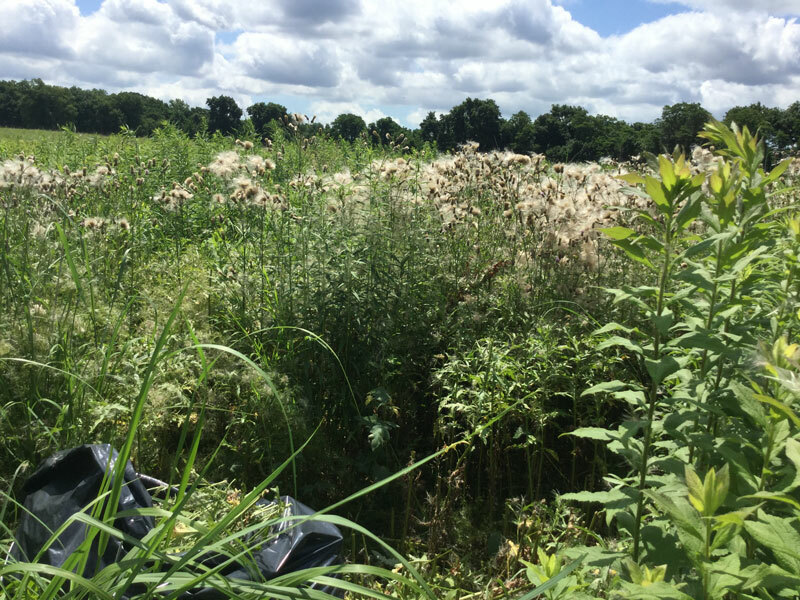 In an effort to increase the native vegetation an ongoing effort since 2016 has been made to dig out invasives and plant natives. Untreated area on the right side of photo. Notice the straw colored warm season grasses in the background. 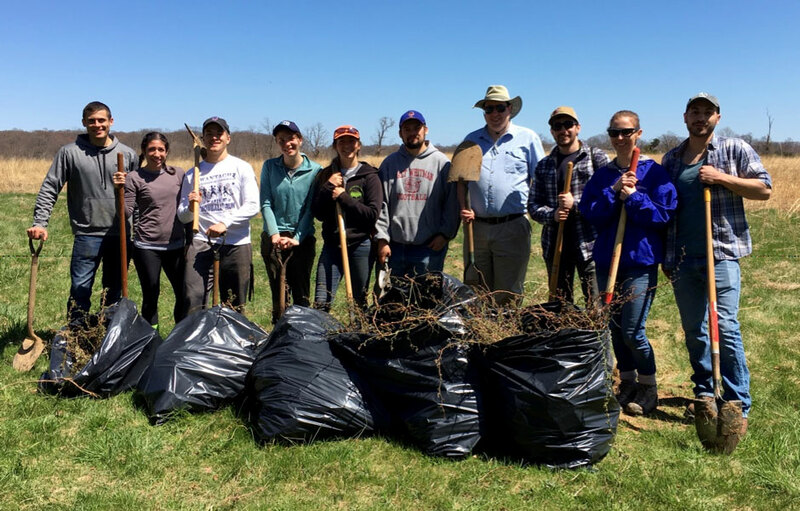 Long Island Water Conference Young Professionals Chapter digging out invasives on April 21, 2018. 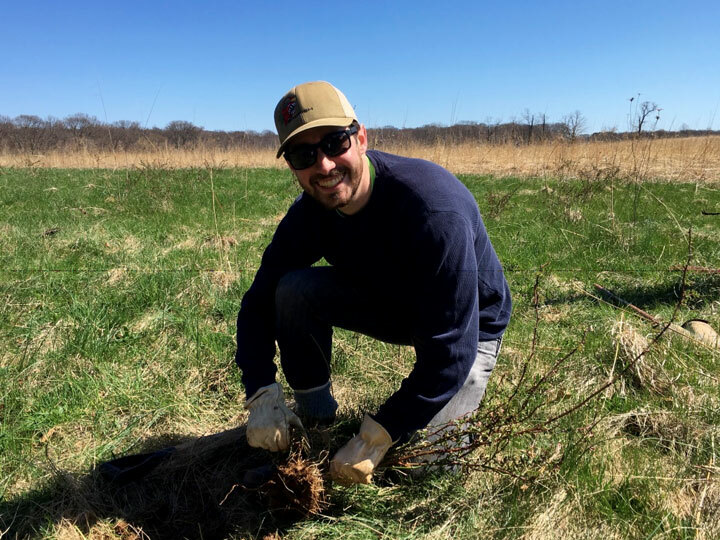 A volunteer holding a multiflora rose that he removed. Directly across the problem area is an invasive hedgerow consisting of multiflora rose and porcelain berry. Due to its close proximity to the grassland, seeds from both invasive plants are easily transferred to the restoration site. During 2018, intensive efforts were made to cut and remove as much of the hedgerow as possible. The management plan is to cut back the hedges to the ground and then maintain this area by regular weed whacking or mowing. 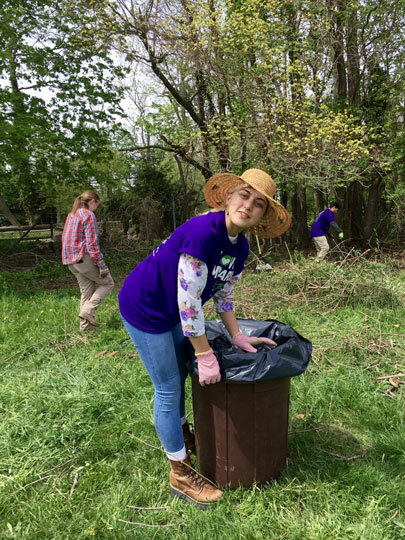 On May 5, 2018 participants of NYS Park "I Love My Park Day" helped cut and bag invasives vines. 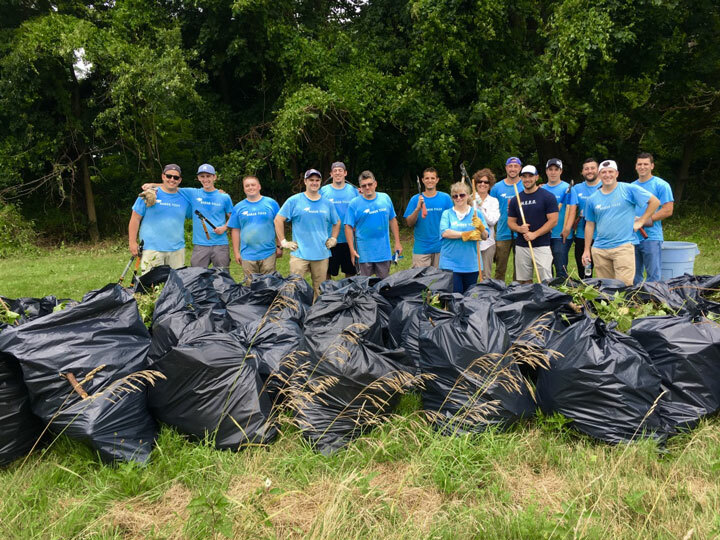 On August 1, 2018 the accounting firm Baker Tilly Virchow Krause, LLP worked hard in the heat pulling, clipping and bagging the hedgerow invasives. Both patrons and scheduled group tours visited the grassland site. 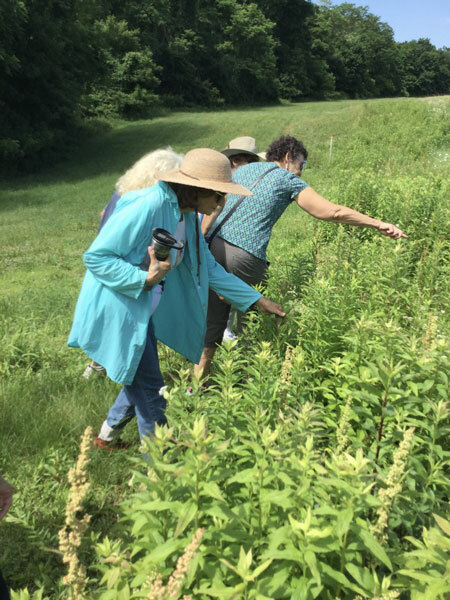 Organizations that toured the restoration field this summer included Cornell Cooperative Extension Master Gardeners, Cold Spring Harbor Jr High administration, Long Island Sound Futures Studies and North Shore Land Alliance. 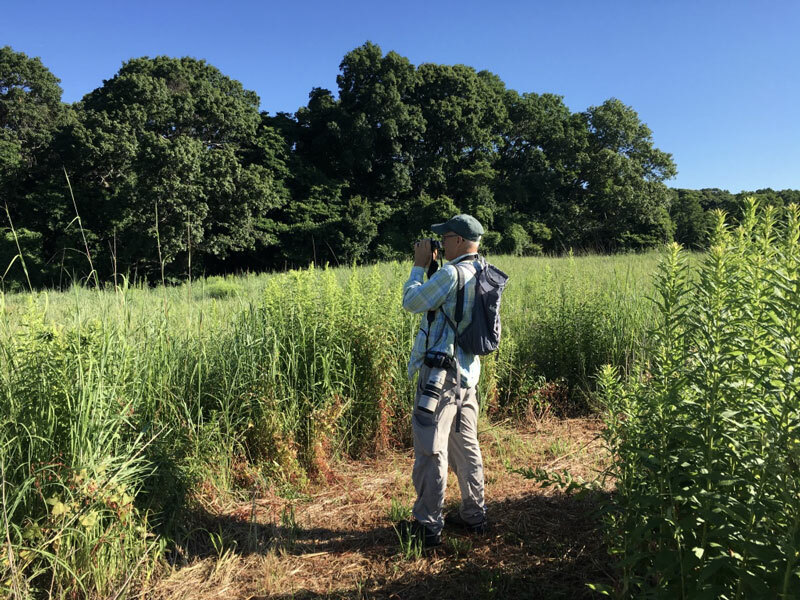 In addition to patrons using this site for photography, painting, studying butterflies and birding the fields serve as an instructional site for land managers, environmental education and most importantly provide the visual benefit that enhances our wellbeing. 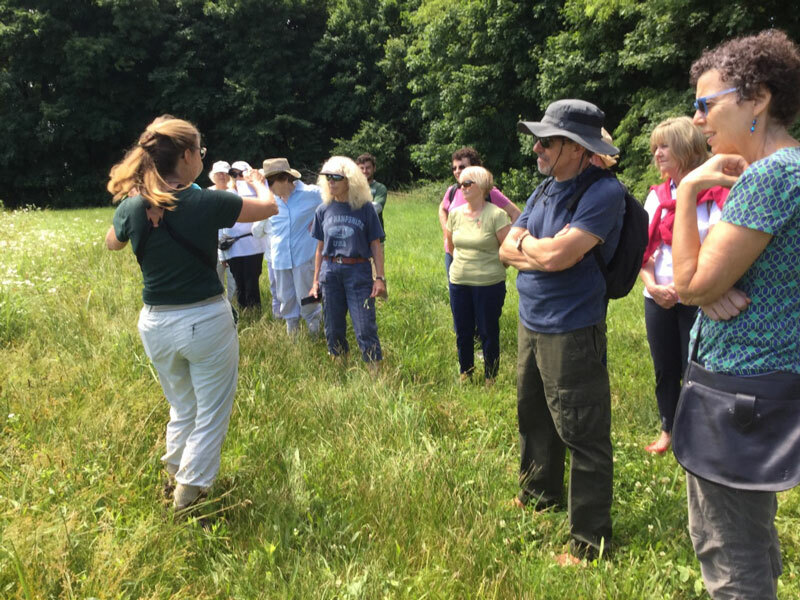 Cornell Cooperative Extension Master Gardeners tour of grassland. More of the Cornell Cooperative Extension Master Gardeners tour. 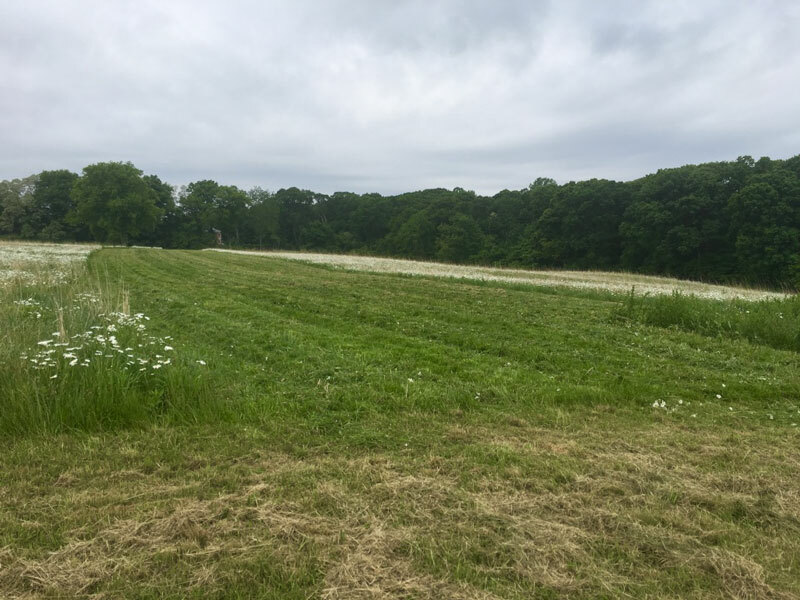 In an effort to enhance the visitor experience and at the same time avoid fragmentation of the grassland a 0.1-mile footpath was cut on the northeastern edge of the 30-acre site. The location of the footpath was based on several factors including topography, plant composition, access and limiting impact on the entire site. The width of the path is approximately 6 feet and allows two individuals to walk comfortably side by side. Small areas alongside the path were solarized in the summer and planted with native wildflowers in the Fall by volunteers. The NYS Park LI Regional Environmental Office has proposed installing an educational native grassland garden at the head of this footpath. 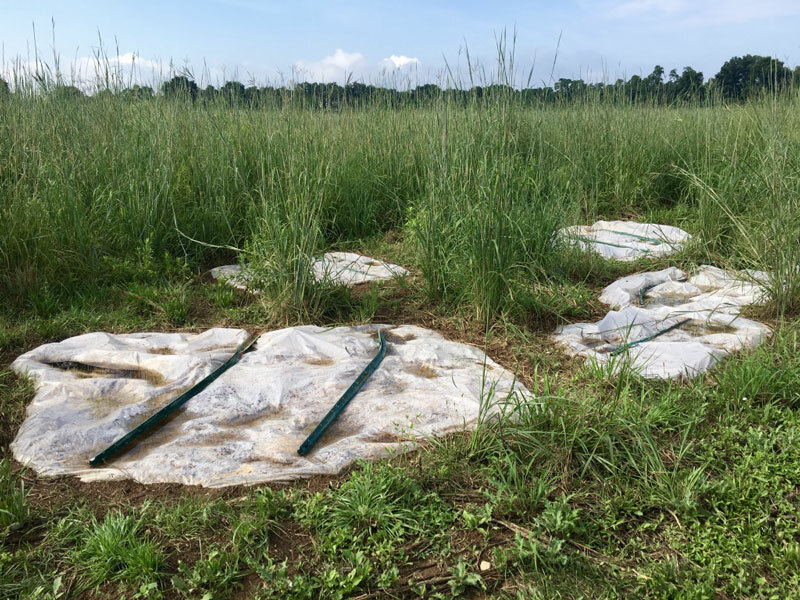 Solarization tarps on the edge of new grassland footpath. Areas that contained invasives were solarized. 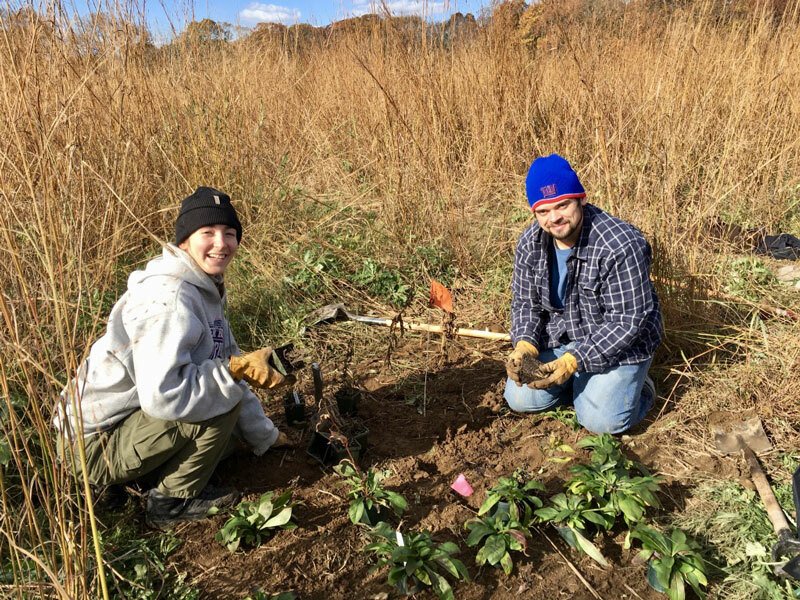 Volunteers planting native wildflowers in solarized area this Fall. 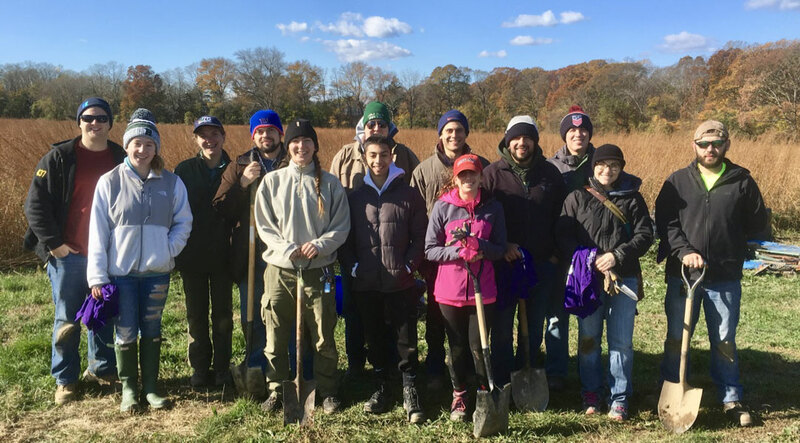 Long Island Water Conference Young Professionals Chapter and local HS volunteers after planting solarized sites. Over 200 natives were planted that day.